During your education as a Professional Chef you study while you work in the hospitality industry. Do you have a knack for cooking and do you want to develop your love for this trade? During your education you realize your ambition to become a professional chef. At the Horeca Academie the lessons are used for practice only. This course leads to a diploma recognised by the Hospitality industry. During the course as a Professional Chef you have practical classes once a week at the Horeca Academie. The rest of the time you spend working in a kitchen as an apprentice chef. For the whole year you will attend a special apprenticeship program in a restaurant. 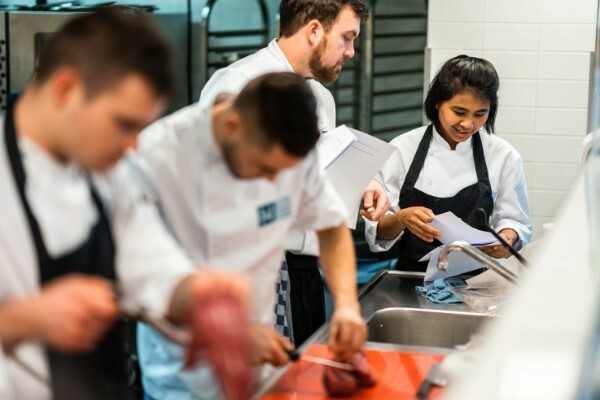 At the Horeca Academie, all our courses have been developed in close collaboration with the industry. Our teachers are professionals from the industry. We are committed to innovation and stay on top of any new developments in the culinary industry. At the Horeca Academie our curriculum contains mainly a hands on and practical approach. Throughout the 10 months tuition, you attend classes once a week. Always the same day in the week, so this does not affect your apprentice schedule. 1. Restaurant class: You cook for our guests in the Horeca Academie restaurant. This is a three-course meal based on the themes of the curriculum. 2. Cooking-Lab class: Again you cook, this time not for guests, but to explore and to experiment with the products that fit the curriculum theme. You start this class with examining the product table. What is it? How do I keep it fresh? What can I do with it? 3. Immerse knowledge class: any subject that needs a little bit more attention is handled in this class. Subjects like special allergies or hazard analysis critical control point (HACCP) are being treated in the immerse knowledge class. €3650,- (payment plan € 365,- per month for 10 months) Diploma fees include: ingredients, uniform, learning materials/books. Subsudie: For this course, apprentice companies cannot claim a subsidy for practical learning. High school diploma or equivalent, evidence of comprehension of English language. No prior culinary experience is required. All students must be aged 16 years or over. The intake process of the Horeca Academie contains a standard test (English basic) and possible motivation interview. The first group starts on March the 27th. We still have spots left! You are welcome to make an appointment with us to ask more questions. Feel free to contact us for more information. When we have 8 English students who all have found an apprenticeship, we can start with the training. We are reaching for march 2019. You can apply for the Professional Chef training as soon as you have found a restaurant where you can work as an apprentice chef. Contact us for the official application forms. Where do I start my apprenticeship? There are a lot of restaurants looking for chefs. So you can start by calling your favorite restaurants to ask if you can work there as an aprentice. Explain them that you are starting with the education at the Horeca Academy. You can also check www.stagemarkt.nl. This is a Dutch website, so if you have problems finding the right restaurant, you can call us and ask us for help. Attention: It is important to let the restaurant where you start your apprenticeship know, that they can not apply for Subsidie Praktijkleren from the Dutch gouvernment for your apprenticeship. Unfortunately, this Subsidie Praktijkleren is not eligible for the education Professional Chef in English. Classes will be at a central location in the Netherlands.